Have you recently noticed a leak in your office’s roof? 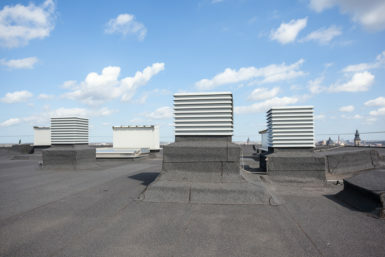 Are you concerned that the roof on a commercial building you own in the O’Fallon, Illinois area won’t be able to withstand a hail storm or other severe weather? If so, make the call to Daech & Bauer Roofing today. We’re a respected commercial roofing contractor that has successfully completed more than 10,000 projects in the area, and our dedication to providing exceptional service has helped us to become a six-time winner of the Home Builders Association Remodeler of Distinction award. When you choose Daech & Bauer, you can trust that we will always stand behind our work. We offer a five-year standard labor warranty, in addition to manufacturer product warranties, to provide you with extra peace of mind about your choice of roofing contractor. In addition, extended labor warranties are available through the Owens Corning™ Preferred Contractor program. Call today to put your commercial roofing needs in the hands of the experts at Daech & Bauer Roofing. We proudly serve O’Fallon, IL and the surrounding areas.